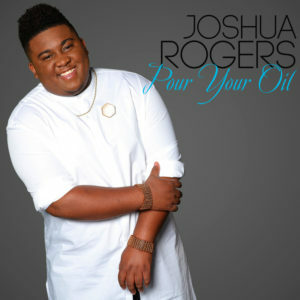 BET’s Sunday Best Season 5 winner and Mixed Bag Music recording artist Joshua Rogers has made his second career entry on Billboard Gospel Airplay Top 30 chart with his newest radio single “Pour Your Oil” spending two consecutive weeks on the chart landing at No. 29 this week. The single continues to gain traction at radio with heavy rotation spins in select markets such as: KHVN Dallas, TX; WFMI Va. Beach, VA; WCAO Baltimore, MD; WFMV Columbia, SC; WAGG Birmingham, AL; KPZK Little Rock, AR. ; WEAM Columbus, Ga; WAAW Augusta, GA; WOAD Jackson, WHLH Jackson, MS; WDJL Huntsville, AL; KRGN Killeen, TX; WFLT Flint, MI; WNZN Cleveland, OH; KPRT Kansas City, MO. Produced by BMI’s 2016 Songwriter of the Year Lucius B. Hoskins (Shirley Caeser, Cheryl Fortune), “Pour Your Oil” is the lead single from Joshua’s forthcoming third album RETURNING (Mixed Bag/eOne NYC) on his new label Mixed Bag Music, which is slated to release later this year. Since the single’s Feb 8th digital release, Joshua continues to showcase his multi-dimensional vocal ability with notable performances and appearances during the 33rd annual Stellar Awards weekend, the Kappa Epsilon Psi Military Sorority Annual Reveille (Orlando, FL), the I hear Music in the Air Concert (Cincinnati, OH), Leandria Johnson and Friends (Savannah,GA) and the Juneteenth/Carver All-School Reunion Gospel Jubilee (Amarillo, TX), WEAM 100.7 Family Day (Columbus, GA), to name a few. Joshua continues to saturate the marketplace with “Pour Your Oil” with upcoming promotional appearances at Heaven 600, Unplugged Praise (Baltimore, MD), Heaven 600 Boat Cruise (Baltimore, MD), The W.A.R Tour in Dayton, OH; Columbus, OH; Rome, NY; and Cleveland, OH, the Blaisdale Concert Hall (Honolulu, Hawaii) and the WXOK 65th Anniversary Concert (Baton Rouge, LA) to name a few. This entry was posted in Gospel, Reviews and tagged Joshua Rogers, Pour Your Oil by Kris Patrick. Bookmark the permalink.